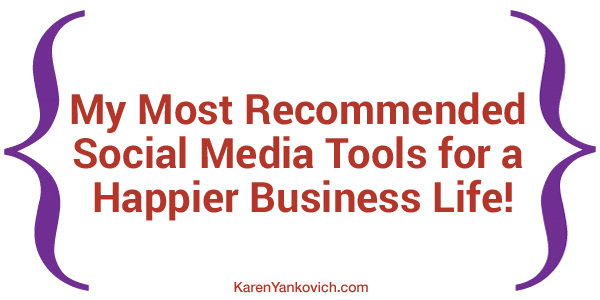 My Most Recommended Social Media Tools for a Happier Business Life! Every business owner needs tools to make their busy days “easier”. It’s efficient, productive, and saves you time which ultimately saves you money. Social media is one of those daily moving parts that I dare say require some tools and tricks of the trade in order to save you time and allow you to focus on the most important aspect of social selling (that most people forget): authentically engaging with prospect customers. Top 4 social media tools that make life easier and why. My top 4 social media tools that make my life easier and why. I refer other business owners to it all the time, and use it myself in my daily business. One of its best features is the scheduler. You can upload a list of posts/tweets/images into distinct queues, schedule a posting time, and Socialoomph will do the rest. This feature sends out your posts from varying queues at the specific interval you request and then places them in the back of the queue to go out again! So you always have a rotating list of evergreen content that is hitting the online ether and keeping you top of mind with your followers. One thing to note: make sure your content is evergreen. What do I mean by that? Set this up one time and add to it as you create more blogs and valuable content for your followers. Then set it and forget it, well not really forget it but you get the idea. This now frees you up to have time to engage your followers and potential customers authentically and in real time. Which is the real point of social media anyway! I recommend using this tool if you are on Twitter in the “Massively Growing my List” phase. Who have I followed lately? Who didn’t follow me back? ManageFlitter answers all of these questions and more in an easy to understand format with analytics. Save yourself some time and grow your list fast with ManageFlitter. Hootsuite is a powerful scheduling and organizational tool that I like a lot because you can see all of your social media platforms and feeds at a glance. This is especially helpful if you manage a few different platforms for clients or have a multilayered social media plan for yourself. For busy entrepreneurs I really like that I can create teams with certain projects/platforms assigned to them. This allows my VA to access what she needs without having 100% access to my entire account and all logins for all of my clients’ social media. This gives me some peace of mind that information is secure, as well as allows me to quickly look and see if everything is running smooth and what areas I need to focus on if not. If your business is product or travel based, or really for any business that has a visually appealing design, Instagram is the place to be. And finally there is a scheduler for that platform! All of this can happen from one application. Unfortunately there is no free membership level, only a short free trial period, but if your business is on Instagram it is well worth paying a nominal fee to have this convenience. Let me be clear here: I am not an affiliate for any of these sites. Each link takes you directly to their main home page, not an affiliate version where I get a cut if you sign up. I recommend these platforms because I have used them with success or use them still today, they continue to save me valuable time and money. So choose one time saving, no more hair-tearing-out, convenient social media tool today and get organized so you can start doing what you really need to do as a business owner: selling yourself. Have a question about a new social media tool or not sure if the tool is useful? Join my LinkedIn group and ask away! I’m there everyday answering questions, providing insights and tips on how to be the most productive you can be on social media as a busy business person today. Thanks Karen for the useful outline of each of these services. This is getting saved in my ‘tools’ folder. Love that! Happy it helps, let me know what works best. I use several of these but hadn’t used SocialOomph in a while. I will go check out again. I have not heard of SocialOomph and have relied heavily on Hootsuite. Thanks for this list! Hope it helps my ever-growing business as a specialized Disney travel agent and saves me time. Love the simple summary here. I’m using most but hadn’t heard of Schedugram. Thanks!